A colorful, delicious addition to any summer party! 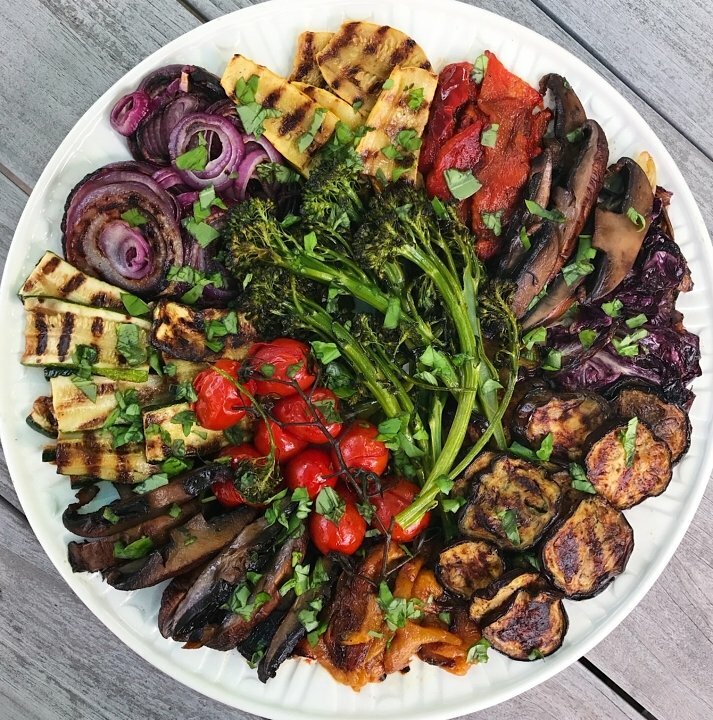 This platter of grilled and roasted veggies is from a barbecue we had in celebration of my Dad’s birthday: Grilled zucchini, yellow squash, portobello mushrooms, baby eggplant, radicchio, red onions and roasted broccolini, red and yellow peppers and tomatoes. It was colorful, loaded with everyone’s favorites and so yummy! But…. if only you saw the mayhem behind the scenes ?I grill and roast veggies all the time but have never made so many different vegetables or such a large quantity at once… let’s just say I did not allot enough time and ended up with the outdoor grill, indoor grill and oven going all at once! ? So many lessons learned ?. But it was all worth it! Plan ahead in terms of type and quantity of vegetables. Think of your guests and their favorite vegetables and consider limiting it to those, and maybe adding in a smaller quantity of other vegetables if you want some additional color. Grill or roast a day ahead of time! This will be a huge time saver and they will taste just as great. Just make your platter and let it get to room temperature before serving. Invest in a grill tray for outdoor grilling. This was key in keeping vegetables from falling through the grill. A grilled and roasted vegetable platter is always a good idea but never so much as at a summer party! It adds color, nutrients and works well with just about everything. I use a combination of roasting and grilling to maximize time and space, but either one will work. Quantity depends on number of people serving. I tend to always end up with too much of some and not enough of others! And I like having extra for the next few days. For all: Clean and leave skin on. The most important thing is to cut vegetables in similar thickness to make cooking easier. In preheated broiler, roast peppers for approximately20-30 minutes, rotating midway through, or until blackened. You want them black so that the skin peels off easier. Remove from oven and place in a brown paper bag, seal and let cool for about 15 minutes. Then remove from bag and the blacked skins should peel off easily. Slice peppers into strips. The key to getting those great grill marks is to not shift the vegetables too frequently once they've been placed on the hot grill. I tend to flip only once. I find the best grill marks are easiest on the grill pan.